Adventures in drawing and making. 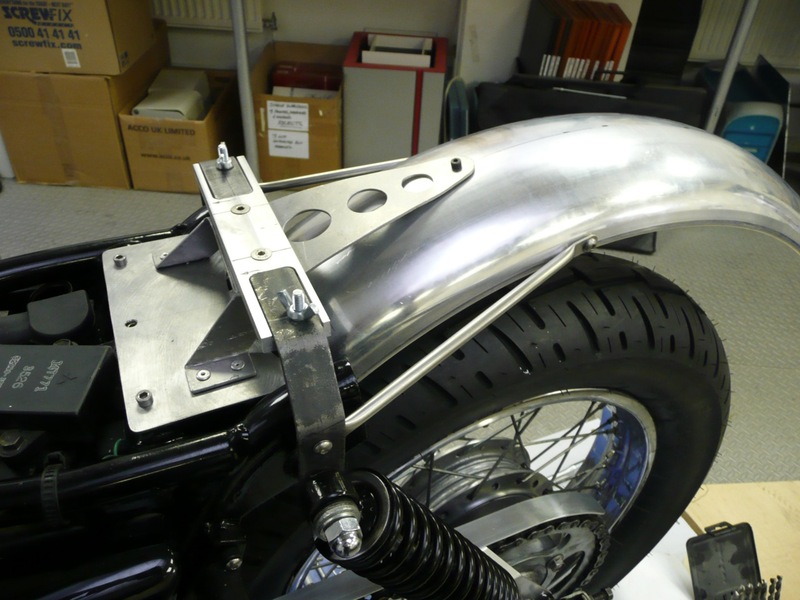 Following my slight diversion to talk about that stunning Moto Guzzi, here we are back again to get started on the metalwork that’s going to hold my rear fender in place. Revisiting my brief again and looking at where I’d got to so far I could see that I was looking to make at least two pieces that would hold the fender on the one hand and then help to tidy up the back end on the other. So the first thing was to turn the piece I’d sketched in my notebook into 3D and see where I stood. 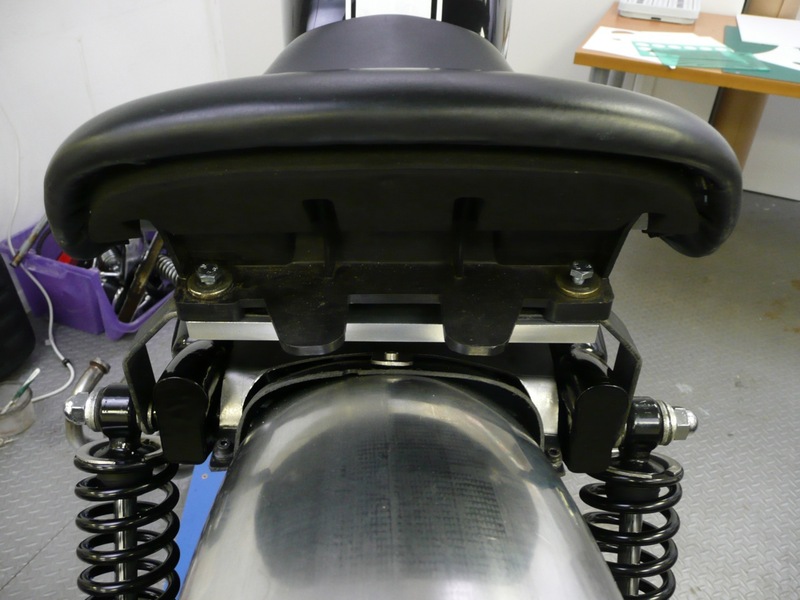 I had the mounting plate I’d put onto the frame rails as one fixing point and I had the cross piece formed by the seat support as another, so I reckoned my next bit would join these two and reach back to support the fender behind the seat mount. You’ll see also from the picture above that I had a mis-match between the curvature of my rolled section and that of the inner plastic guard which sat in front of the rear tyre. I’d need something to deal with that too but for now I wanted to get on with the fender support. Crisp thin card, lovely stuff. It’s an age old adage, and you’ll here it from many a craftsman/maker, that it’s always best to measure twice and cut once. This simple advice has saved my bacon on many an occasion. In situations such as this where I’m working without any kind of formal technical drawing of a part I bring a second safety net into play and that is to make pieces in card first, change and modify things until I’m happy and then carefully replicate what I end up with in metal or whatever material I happen to be working in. Again you’ll hear it from all quarters that knocking things up in card is a great way to avoid time consuming, and sometimes expensive mistakes. I’ll say a bit more about card in the following post. Holes added for visual lightness. Happy that my card creation was what I wanted I marked out the resultant shape in flat form on my sheet of steel, making any final adjustments to dimensions and hole positions. I did most of the metal cutting for this build with a jigsaw fitted with a fine toothed blade for metals. Working slowly and methodically it proved to be the best way to cut out flat parts that required the minimum of hand finishing by file. Cut out and finished, I bent the piece to shape in a large bench vice and positioned it to allow me to mark the hole centres for fixing it to my frame plate and the fender, which by this stage I’d shortened to close to the final length. 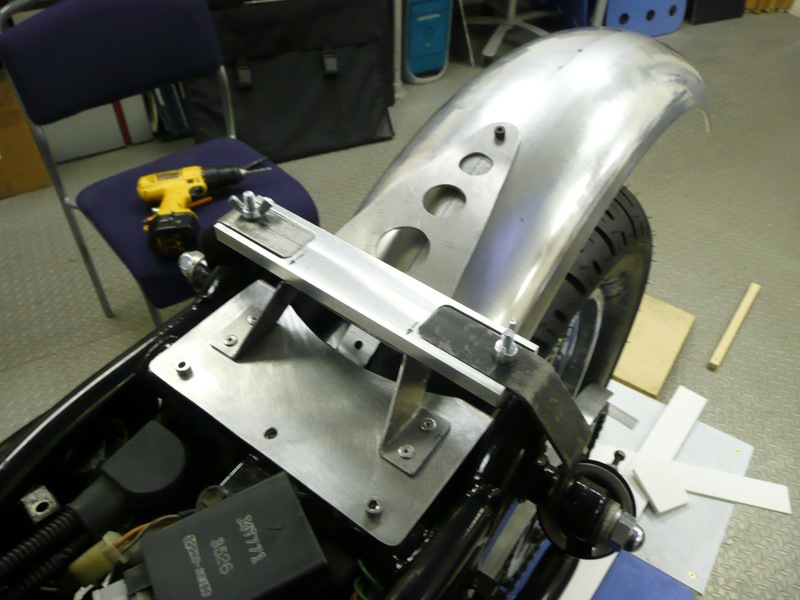 I then riveted it in place on the plate and put a small bolt through the hole to secure it to the fender. This really went some way to eliminating the flexing I was worried about, particularly in the vertical plane but there was still quite a bit of movement in the horizontal. I decided that I needed to create some side supports and elected to put two thin tie bars between the seat support mounts and the sides of the fender part. I had some scraps of stainless tubing to hand and these worked perfectly after I’d flattened the ends of my lengths, drilled mounting holes, put a radius at each end and bolted them in place. Fixing things in this way, with nuts and bolts, meant that I would always be in a position to take it all apart should I ever need to mend, modify, replace or repaint anything in the future. At the same time I chose to make everything even more sturdy by drilling two more M6 bolt holes through the seat support cross member and the new fender support piece. At this point in the game everything was rock solid and I was more than happy. Next up, finding a home for all the stuff that was going to be mounted on the fender itself. 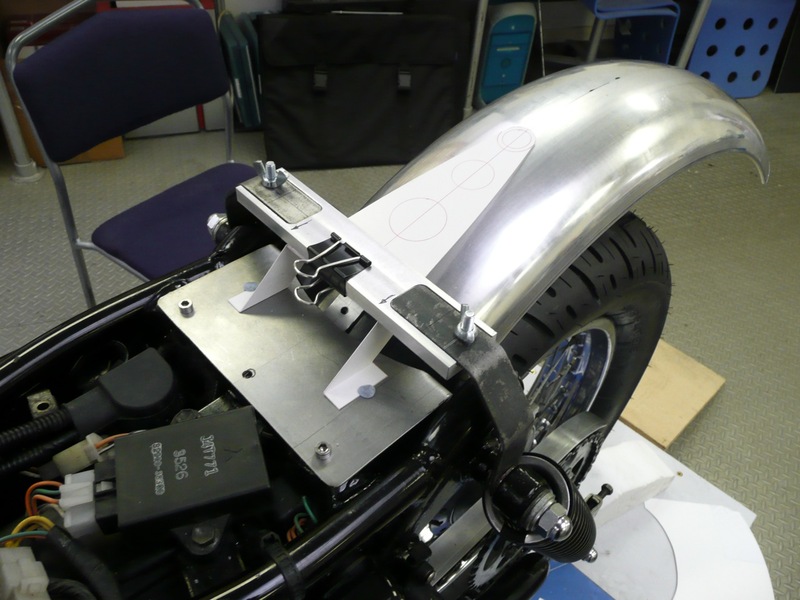 This entry was posted in Bike build, Rear fender, The 250 by Soulcraftcandyman. Bookmark the permalink. I'm a self employed illustrator, modelmaker, prototype builder and one time 3D designer.